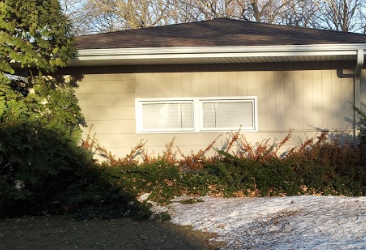 Minnesota's harsh climate can cause severe damage to landscape plants. injure or kill branches, flower buds, and roots. Snow and ice can break branches and topple entire trees. Salt used for deicing streets, sidewalks and parking lots is harmful to landscape plants. Winter food shortages force rodents and deer to feed on bark, twigs, flower buds and leaves, injuring and sometimes killing trees and shrubs. Here are steps you can take to protect trees and shrubs and minimize injury. Roots do not become dormant in the winter as quickly as stems, branches and buds, and roots are less hardy than stems. Roots of most trees and shrubs that grow in Minnesota die at temperatures at or below 0 and up to 10 degrees. These plants survive in Minnesota because soil temperatures normally are much higher than air temperatures and because soil cools down much more slowly than air temperature. Many factors influence soil temperature. Moist soil holds more heat than dry soil, so frost penetration will be deeper and soil temperatures colder for sandy or dry soils. Snow cover and mulch act as insulators and keep soil temperatures higher. With newly planted trees, cracks in the planting hole allow cold air to penetrate into the root zone, reducing fall root growth or killing newly formed roots. Mulch new trees and shrubs with 6 to 8 inches of wood chips or straw. If the fall has been dry, water heavily before the ground freezes to reduce frost penetration. Check new plantings for cracks in the soil and fill them with soil. Repeated freezing and thawing of soil in fall or spring causes soil to expand and contract, which can damage roots and heave shrubs and new plantings out of the ground. A 4- to 6-inch layer of mulch will prevent heaving by maintaining more constant soil temperatures. Sunscald happens when there are elongated, sunken, dried or cracked areas of dead bark, usually on the south or southwest side of a tree. On cold winter days, the sun can heat up bark to stimulate activity. When a cloud, hill or building blocks the sun, bark temperature drops rapidly, killing the active tissue. Young trees, newly planted trees, and thin-barked trees (cherry, crabapple, honey locust, linden, maple, mountain ash, plum). Older trees are less subject to sunscald because the thicker bark that can insulate the tissue remains dormant and cold hardy. Trees pruned to raise the lower branches, or transplanted from a shady to a sunny location, because the lower trunk is does not have shade. Prevent sunscald by wrapping the trunk with white guards to reflect the sun and keep the bark at a more constant temperature. Use a white commercial tree wrap or plastic tree guards. Do not use brown paper tree wrap or black colored tree guards as they will absorb heat from the sun. Wrap newly planted trees for at least two winters and thin-barked species up to five winters or more. Put the wrap on in the fall and remove it in the spring after the last frost. Trees will typically heal themselves through new growth of the inner bark or along the edges where the bark split. However, it may be necessary to repair the damage. Sterilize a sharp knife by dipping in 10% bleach solution (1 oz. bleach, 9 oz. water) or soak in 70% alcohol for 3 minutes. Following the general shape of the wound, use the knife to remove dead bark to reveal live tissue. Rounding off any sharp corners to facilitate healing . Leave the wound uncovered. Do not apply paint, tar or a commercial tree wound dressing to the open wound. If the type of tree is susceptible to a fungus, spraying the area with a fungicide may help prevent fungal infection of the wound. Encourage good tree health and growth by fertilizing it in the spring, mulching the root area, and watering during dry weather. Wrap the tree in winter to prevent further sunscald. Forsythia on the left lack winter-hardy flower buds. Only flower buds that were covered by snow are blooming. A forsythia with winter-hardy flower buds in full bloom on the right. 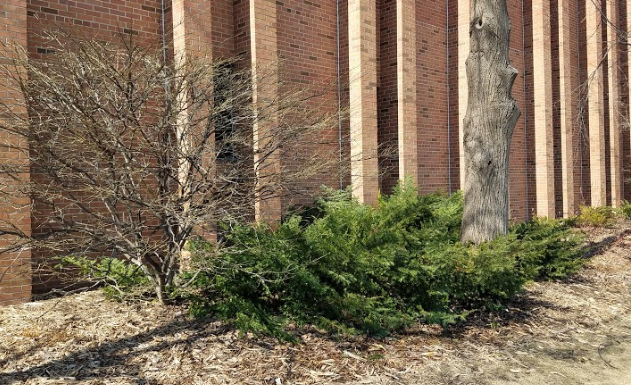 Deciduous trees and shrubs can suffer shoot dieback and bud death during the winter. Flower buds are more susceptible to injury than stem or leaf buds. A good example of this is forsythia, where plant stems and leaf buds are hardy, but flower buds are very susceptible to cold-temperature injury. Little can be done to protect trees and shrubs from winter dieback. Put plants that are marginally hardy in sheltered locations. Plants in a vigorous growing condition late in the fall are most likely to suffer winter dieback, so avoid late summer pruning, fertilizing, and overwatering. Fertilize in the spring on sandy soil or in the fall on heavy soil after the leaves have dropped. Winter sun and wind cause excessive foliage water loss while the roots are in frozen soil and unable to replace lost water. This results in desiccation (drying out) and browning of the plant tissue. Bright sunny days during the winter warms plant tissue, which in turn initiates cellular activity. Then, when the sun sets or goes behind clouds, foliage temperature can drop, injuring or killing the foliage. Bright, cold winter days destroy chlorophyll in the foliage. The chlorophyll does not re-synthesize when temperatures are below 28 degrees. This results in a bleaching of the foliage. Cold temperatures occurring early in the fall before plants have hardened off completely or in late spring after new growth has occurred can result in injury or death of this non-acclimated tissue. Leaf damage normally occurs on the south, southwest, and windward sides of the plant, but in severe cases it may affect the whole plant. 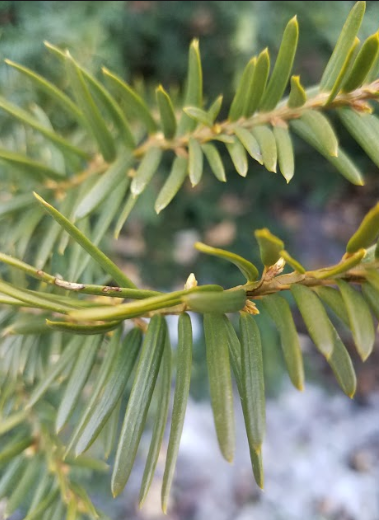 Yew, arborvitae, and hemlock are most susceptible, but winter browning can affect all evergreens. New transplants or plants with succulent, late season growth are particularly sensitive. Plant evergreens such as yew, hemlock, and arborvitae on north and northeast sides of buildings or in areas protected from wind and winter sun. Prop pine boughs or Christmas tree greens against or over evergreens to protect them from winter wind and sun, and to catch more snow for natural protection. Construct a barrier of burlap or similar material on the south, southwest, and windward sides of evergreens. If a plant has exhibited injury on all sides, surround it with a barrier, but leave the top open to allow for some air and light penetration. Keep evergreens properly watered throughout the growing season and into the fall. Never stress plants by under- or overwatering. Decrease watering slightly in September to encourage hardening off, then water thoroughly in October until freeze-up. Watering only in late fall does not help reduce injury. Do not prune after August as pruning can induce the growth of new foliage. Anti-desiccant and anti-transpirant sprays are not effective for protecting evergreen foliage. Brown foliage is most likely dead and will not green up. But the buds, which are more cold hardy than leaves, will often grow and fill in areas. Wait until mid-spring before pruning out injured foliage. If the buds have not survived, prune dead branches back to living tissue. Fertilize injured plants in early spring and water them well throughout the season. Provide appropriate protection the following winter. Wrap relatively small trees together or tie the leaders with strips of carpet, strong cloth or nylon stockings two-thirds of the way above the weak crotches. Remove these wrappings in spring to prevent girdling, and to allow free movement of the stem. Proper pruning, to eliminate multiple leaders and weak branch attachments, will reduce snow and ice damage. For trees with large wide-spreading leaders or large multi-stemmed trees, a professional arborist should cable the main branches together. Minnesota is reducing the use of salt (chloride) for deicing walks and roads in an effort to reduce the negative effect on our environment, especially our water. It can cause or aggravate winter injury and dieback of trees and shrubs through salt runoff from roads, and by salt spray from traffic and snowplows. Runoff leads to salt buildup in the soil that can injure roots and be absorbed by the plant, ultimately damaging the foliage. Salt spray can cause severe foliar or stem injury. Do not plant trees and shrubs in areas where salty runoff collects or close to streets where salt spray is prevalent. Burlap barriers may provide protection to some plants from salt spray. Avoid or reduce the amount of de-icing salts used on walkways by clearing areas of snow as soon as possible. Apply the minimum amount of salt needed and only where needed. Avoid spreading salt on grass and in ditches where water collects. Use alternative de-icing salts such as calcium chloride and calcium magnesium acetate (CMA). Keep plants healthy throughout the year. Provide adequate irrigation and mulching to reduce water loss. Prune and add fertilizers to correct nutrient deficiencies. Control damaging diseases and pest infestations. Mice, rabbits, voles and deer can all cause severe damage to plants in the winter by feeding on twigs, bark, leaves and stems. They can eat shrubs to the ground and also girdle trees and shrubs by chewing through the bark. The best overall strategy for protecting your trees and shrubs from animal browsing is to reduce areas of habitat and erect physical barriers to prevent them from getting to your plants. Reducing animal damage on plants starts with eliminating protective cover and a desirable nesting environment. Cut grasses and other vegetation short in late fall within 2 feet of young trees to reduce protective cover for mice and voles that might feed on trunks and stems. Discourage rabbits from taking up residence in your yard by reducing protective cover, removing brush piles, and fencing off other hiding places such under decks and other structures. Protect tree trunks with cylinders of ¼-inch mesh hardware cloth around the trunk of the tree about 6 inches away from the trunk. This can be kept on year-round. For mice, the cylinder should extend 2 to 3 inches below the ground line. For rabbits, the cylinder should extend 18 to 24 inches above the anticipated snow line. Make sure there are no gaps between the bottom of the mesh cylinder and the ground where animals could crawl under the fencing. For small trees, plastic tree guards are also effective. Protect shrubs from rabbits by fencing the beds with hardware cloth. Enclose the lower branches as well as the trunk. Check fenced areas frequently to make sure rabbits aren't trapped inside. If you have many trees or shrubs to protect, using screens and wraps may be too expensive and time consuming. In such situations, repellents may be the best solution. A repellent is not a poison, it simply makes plants taste or smell bad to animals. Spray or paint repellents on trees and shrubs. One application of a repellent is usually enough for the entire dormant season. Deer feed on terminal and side branches of small trees and shrubs. They may rub their antlers and foreheads on tree trunks in late summer and early fall to remove the velvet covering from their new antlers (called deer rub). This can damage tree bark going into winter months. The Minnesota Department of Natural Resources considers deer a protected game species. Therefore, the best strategy is to remove habitat options and erect physical barriers. If deer are starving, there is little that will prevent them from feeding on your plants as hunger will overcome a bad taste or fear. Manage deer by excluding them with fencing. Fences should be 8 feet high and well-constructed to prevent deer from breaking down the fencing or jumping over it. When motivated and provided enough space to get a running start, deer can clear fences as high as 12 feet. Electric fencing such as that used for cattle may also provide some protection from deer. Various repellents exist on the market in liquid, granular or powder forms. Most need reapplication after rain or irrigation.